← No, Brian. Just, no. Well done, North Coast Public Health Unit. Meryl Dorey today sent out a press release and a blog post containing accusations that Public Health officials aren’t taking her seriously, and that they are therefore disrespecting Dorey, the AVN and, get this, parents. In a stunning bout of hypocrisy she invited Paul Corben to attend her Lismore seminar. When Mr Corben declined (and a tantalisingly blunt refusal it was), Dorey went all Meryl on us and bleated to the gallery that he was being disrespectful. Gee. I wonder why Mr Corben will have nought to do with Dorey’s money grabbing stunts? This is false. We met with Paul Corben, Dr Kerry Chant and Chris Crawford on 8 May 2009. 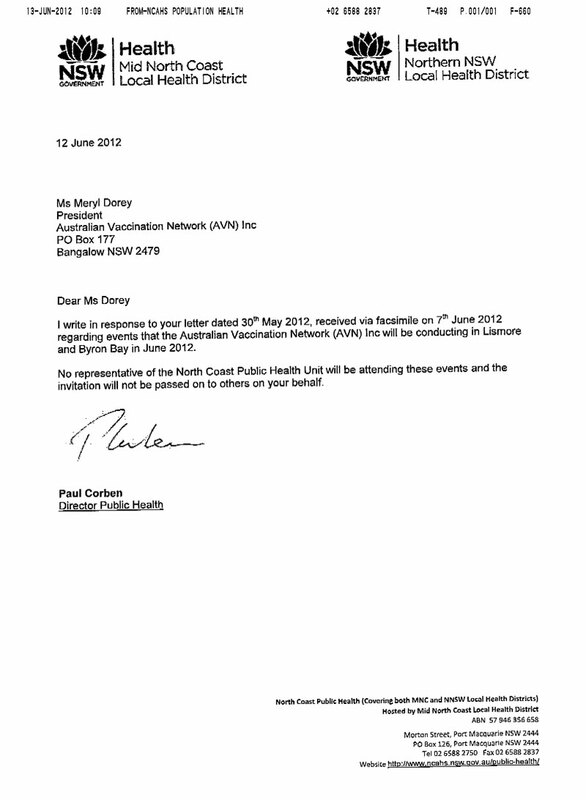 We showed them the letters and emails we had received, including the AVN brochure. We expressed our concern at the harassment and fears that people were trying to spin the facts on Dana’s death. We asked a direct question of Mr Corben, and he confirmed that Mrs Dorey had contacted him on 12 March 2009. He then provided a written email to us on 19 May 2009. I had googled Dana’s name one night, and found the discussion on Yahoo where Mrs Dorey and AVN members were discussing Dana’s death. I emailed him in disbelief and he confirmed the phone call in response. What would Dr Brian Martin make of Dorey’s attempts to contact Mr Corben, given she has so horribly portrayed him as someone who would harass a grieving family? Surely, Martin would advise Dorey that she has so destroyed any chance of the whiff of conversation with Mr Corben, that it would be hypocritical – grubby, even – of her to attempt any engagement, right? Because that’s the defence he provides for Dorey, for her refusal to answer questions from Stop the AVN. This entry was posted in anti-vaccination dishonesty, australian vaccination network, AVN, hypocrisy, meryl dorey, stop the australian vaccination network, vaccination and tagged anti vaccination, australian vaccination network, AVN, Brian Martin, dishonesty, hypocrisy, meryl dorey. Bookmark the permalink. 0 Responses to Well done, North Coast Public Health Unit. Well written. I remember the “breach of confidentiality” claim now. Golly. I left a very nice comment on Meryl’s blog which of course has been censored to date. But I honestly think apart from all the other reasons for medico’s not associating with or legitimising the AVN, they don’t represent non-vaccinating parents. They provide an outlet for pseudoscience, anger and (do excuse me) arse holes like Punter to push the antivaccination barrow. They try to smear vaccination as causal in sickness, death and even epidemics of VPDs. And honestly, just read this list of topics. The “mandatory vax” gambit and vaccines causing autism at a rate of 1 in 20 are hard to miss. That’s career sabotage right there umpire! excellent – gotta love his response. And also because we are at the national immunisations conference in Darwin, talk to Meryl’s 15 people or talk to the 500 registered at the conference -which should I choose?